The architecture is “Centric”: any communication between users and on site equipment is carried via the control center. 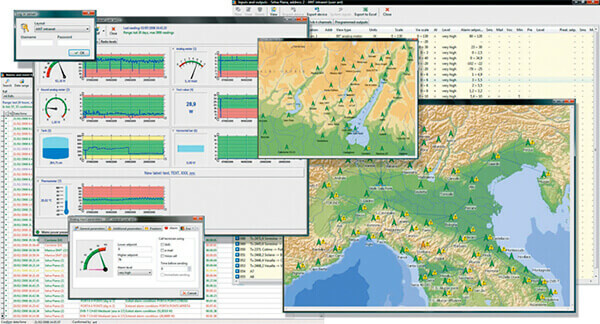 The control center is composed of a PC running a server application, with one or more network interfaces to com- municate with the remote sites. The system is enough free to use without being obliged to depend by the company. The customer is not tied to our device, because it can make it according to its own pleasure in a few minutes. The brain of the system is the software, designed to be future proof/futuristic. It is an NMS software suite, based on a client-server concept. The NP Manager, the server application, grabs information from any Agent and Stores it all in the database. The data control engine automatically checks for connections with RDFs, Agent grabs incoming data, generates alarms, creates statistics, sends email and SMS. It also takes care of managing client applications, connected to its services. The NP Manager will collect data from all RDFs and SNMP agents inside equipment on the field, and send all commands to the remote equipment. The NP Supervisor, the client application, is an easy-to-use and user friendly GUI, to easily manage and configure the entire network. This system is a real multi-user system, with real time access available, that can also be split into areas, regions, and accessed according to hierarchical levels. Username and password will grant access rights on an input-by-input or equipment base. The control software, developed with broadcasters in mind and according to broadcasters requests, increases the value of your maintenance simplifying diagnostics with an ‘up to the input’ interface. It is modular, and thanks to a series of PIMs (Plug In Modules) it can be customized, to fit any network size and maintenance structure. Any user can start with a very basic and easy to use system, and grow up to a very comprehensive and detailed surveillance system. The software is simple and quick to configure, granting total control! NP is smart! 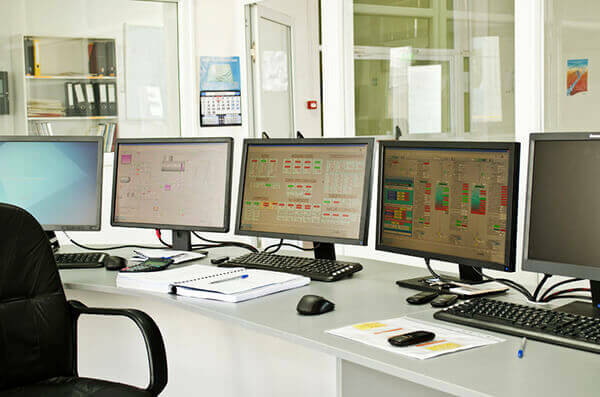 ...It features controlled logging of users, events storing, dispatches warnings to technicians (e-mail, SMS), collects alarms, sets alarm hierarchy, local and remote automation, tools data analysis and reports, providing complete documentation of every event. The user can log into the system only after authentication: access can be achieved with a client application (NetPOD Supervisor) using a TCP socket. 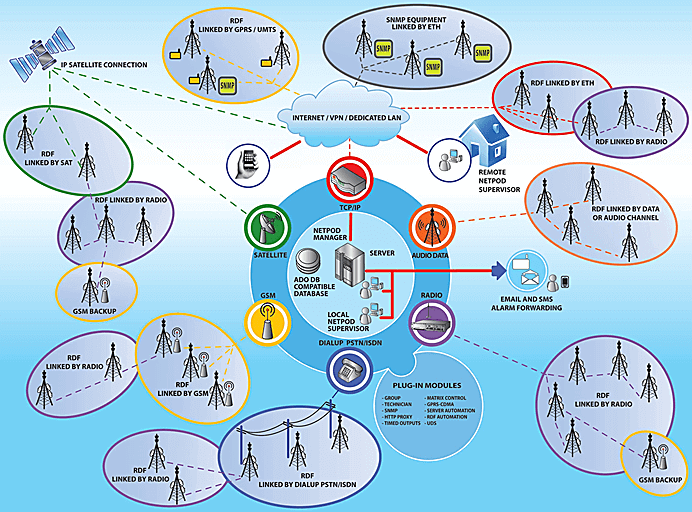 Access can be local (LAN) or remote (Internet). The platform is planned to provide the maximum safety and privacy: also for companies that offer the management of the network in outsourcing or as a service. Everyone can gain advanta- ge from NetPOD. NetPOD is a modular suite that can grow according to management requirements. PIM (Plug-in modules) is the name of the additional software modules: they do not require additional installations, the activation key is embedded in the license. Access to the information is controlled by multi-level authentication; access is set site by site, and user by user, granting complete safety. Scalable from a few inputs to thousands of I/Os: easily upgradeable. User-friendly and charming user interface: could it be easier? Power and reliability, designed by people that know what broadcasters want.